We offer the best apartment living in Savannah GA, rated Top 10 Cities in the United States" (#7) - Condé Nast Traveler, November 2014. With our three complexes - Garden Lake Townhomes on the west side, the Moss Gate apartments on the south side, and the new Retreat at Henderson Lakes in the Berwick area - we have the location, style and floorplan you're looking for at a price you can afford. Our 30-unit Moss Gate boutique complex features loft-style, one bedroom apartments, located in the coveted south side of Savannah within easy walking distance to shopping, dining and entertainment. The small size and established style of this boutique complex offer a welcoming warmth in an intimate, wooded setting. Close to Armstrong Atlantic State University, with a convenient bus stop right in front, it is ideal for students! 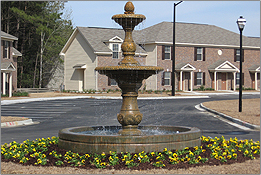 On the west side of Savannah, The Retreat at Garden Lake features every sought after amenity including a fitness center, high speed internet access, and a washer and dryer in every unit. Located in beautiful, convenient Garden City, this 210-unit apartment neighborhood offers one- and two-bedroom elegant townhome living in a beautiful wooded setting. The Retreat at Henderson Lakes offers everything you are looking for in luxurious townhome style living. All new construction featuring super spacious 1 and 2 bedroom floorplans, powder room on the first floor for guests, deluxe kitchens, washer and dryer included in all 1 bedroom units and washer and dryer connections in all 2 bedroom units. The magnificent pool, cabana and fitness areas provide endless opportunities for relaxation and wellness. Located at 653 Little Neck Road off Hwy 17, The Retreat at Henderson Lakes is just moments from Hwy 204 and a short drive to Chatham Parkway or I-95 or I-16.